Twenty NGOs have urged President Abdulla Yameen to stop plans for oil exploration in Maldivian waters, or risk the country’s economic and environmental health. In a joint statement of concern, marine conversation NGO OceanCare’s President Sigrid Lueber warned that the oil explorations could have “severe socio-economic consequences in the fisheries and tourism sector”. After pledging during his election campaign to begin new efforts to find oil, President Yameen’s government has claimed investor interest in the project, while a German research vessel carried out a seismic survey last August. Speaking to Minivan News today, founder of local environmental NGO Ecocare, Maeed Zahir, said that the public does not take seriously the concerns put forward by local NGOs. The statement of concern was also sent to several members of the cabinet, including fisheries minister Dr Mohamed Shainee, tourism minister Ahmed Adeeb, economic development minister Mohamed Saeed, and environment minister Ahmed Thoriq. President’s Office Spokesperson Ibrahim Muaz said that only the president could comment on correspondence addressed personally to him, directing Minivan News to the relevant ministers for updates on the exploration project – none of whom were responding to calls at the time of publication. The Maldives has also been included OceanCare’s silent oceans campaign. The NGO – which was granted Special Consultative Status with the UN’s Economic and Social Council in 2011 – is encouraging people to write to Adeeb urging an end to exploration. The NGO coalition’s statement of concern warned that exploration will have adverse effects on the Maldivian economy as a result of negative impacts on fisheries. 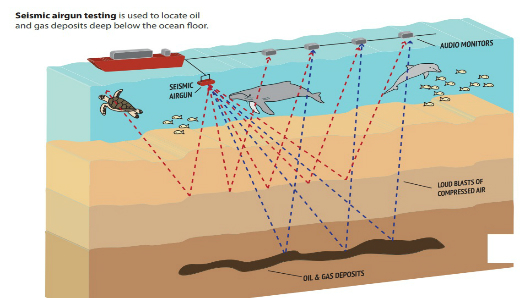 Seismic air guns – one of the most commonly used survey methods for offshore oil exploration – produce loud bursts of sound by introducing air into water at high pressure which then penetrates hundreds of kilometers into the earth’s crust. OceanCare stated that the air guns produce a pulse of noise lasting 20 to 30 milliseconds, which is repeated an average of every 10 to 15 seconds, often for 24 hours a day. A recent study commissioned by the Namibian government revealed a sharp decline in catch as a result of increased seismic exploration in the Orange River Basin. The country’s tuna catch shrunk from 4,046 tons in 2011 to a mere 650 tons in 2013 after a shift in migratory routes. Similarly, the Australian tuna industry has said the process may threaten the survival, abundance, or evolutionary development of native species or ecological communities. Additionally, a recent study into the impacts of air guns on marine life ranked them as the second highest contributor of underwater noise caused by humans – only underwater nuclear detonations have been found to cause more. The NGO statement also noted the adverse effects on marine biodiversity as a result of such surveys, pointing out that Maldivian tourism is heavily dependent on a healthy and diverse marine eco-system. Tourism and fishing account for 90 percent of the Maldives’ GDP, while providing three-quarters of all employment and two thirds of foreign exchange earnings. The government’s development plans include both a reduced reliance on tourism, as well as minimising the country’s dependence on imported fuel through the enhanced use of renewables. Imported fuel consumes around one third of the Maldives’ GDP. Last year, the German research vessel ‘Sonne‘ – which came to the Maldives to conduct research into global warming – conducted preliminary research exploration free-of-charge on the government’s request. While pointing out the importance of proper Environmental Impact Assessments in oil explorations, the coalition of environmental groups expressed concern that no such EIA or public consultation was undertaken prior to this research. Speaking at the time, fisheries minister Dr Shainee said that explorations will be carried out in one of three areas which have properties suggesting the presence of oil and gas. The identified locations were located 100 miles east of the area between Laamu and Thaa atoll. Shainee also said that the information obtained will be shared with the Maldives in the first quarter of 2015. He said that the data would not be shared with any third party, and that further explorations would follow to confirm any positive findings. In February 2014, the Maldives National Oil Company Ltd – a subsidiary of the State Trading Organization – said it would soon begin advertising the country as a destination for oil exploration. Speaking at the 18th Saarc Summit held last year, Indian Prime Minister Narendra Modi said that India wishes to assist Maldives in its search for oil reserves, while cabinet members reported that oil exploration was on the agenda of the first China-Maldives joint commission on trade, held in December. The operators of a Safari boat whose staff and visitors were pictured with endangered shark species have assured that they pay special attention to environmental conservation, denying that the images showed shark fishing. Furamaana Travels – which operates the Bolero Safari boat – told Minivan News that several endangered and protected species including sharks and sting rays were caught before being released back into the ocean after removing the lines and hooks. “How would they know what they caught before they fish it out of the water? As soon as it was discovered that endangered species were caught, the safari crew removed the hooks and line. They were released into the sea, unharmed”, said a Furamaana staff member. 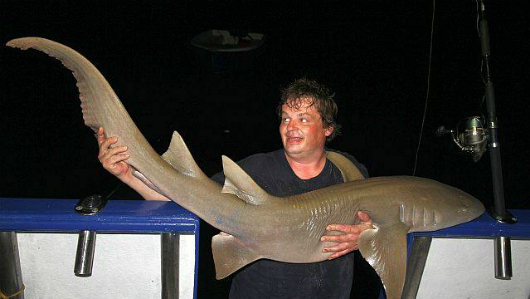 Photos of a night-fishing trip on the boat have prompted outrage, as they appeared to show tourists and staff members holding several species of live shark – which are protected under Article 4 (a) of the Environment Protection Act. The Environmental Protection Agency’s Director General Ibrahim Naeem told Minivan News that it is currently contacting the relevant parties, including Furamaana Travels, to clarify information about the matter. “We will only be able to take any steps after all facts surrounding the matter has been clarified. We will take action depending on the severity of the offence”, Naeem stated. Ali Rilwan, Executive Director of local environmental NGO Bluepeace stated that the NGO does not feel the incident to be an issue “from a conservation point of view” as the caught animals were released back into the ocean. “Safaris in Maldives operate in a very ethically correct manner, once caught they cannot just cut the line and release it, they have to remove the line and hook before doing so. Taking a photo before the release is not an issue, I do not see this in a negative light”, said Rilwan. Local NGOs last month condemned images showing a turtle being cut in half for its eggs and meat, prompting the fisheries ministry to commence work on introducing stricter fines – up to MVR10 million (US$650,000) for illegal capture of turtles and tortoises. Meanwhile, a ceremony was held today at EPA Agency to award the fishermen of Madduvari in Meemu Atoll for rescuing a stranded whale-shark from a shallow lagoon near Maduvvari Island. China has today pledged to provide the Maldives with 200,000 energy efficient LED lights as part of an MoU for the provision of goods to assist in combatting climate change. “Approximately MVR300 is estimated to be saved if the LED lights are used for 8 hours per day and if 75% of the LED lights which has been provided are used, MVR49 million would be saved,” read a press release from the Ministry of Environment and Energy. The ministry last month launched the ‘It’s cool at 25’ campaign to reduce energy consumption in the country and potentially save MVR8,000 (US$519) – or seven percent – from household electricity bills. Minister of Environment and Energy Throriq Ibrahim signed the MoU on behalf of the government, while Deputy Head of Commission at the Chinese Embassy in Maldives Liu Ching signed on behalf of the Chinese government. In addition to providing an additional 250,000 LED lights in 2013 – subsequently used across 164 islands – China has more recently donated 200 waste bins worth MVR500,000 (US$32,425) to the Maldives. As well as a steady stream of grant aid, the Chinese and Maldivian governments have recently penned deals regarding military aid and the development of Ibrahim Nasir International Airport, as well as the Chinese promising to “favorably consider” financing the Malé-Hulhulé bridge project. A two-day workshop on ‘National Biodiversity Strategies and Action Plans (NBSAP) Revision and Development of Fifth National Report’ has started today (May 22) at Nasandura Palace Hotel. The aim of the workshop – organised by the Ministry of Environment – is to prepare plans to comply with the Convention on Biological Diversity, which the Maldives ratified in 1993. The workshop was inaugurated by Minister of state for Environment and Energy Hassan Shah who highlighted the economic benefits of conserving biodiversity, stressing that more work needs to be done to increase public awareness of conservation laws. Shah also highlighted the importance of participants taking the opportunity to ensure that the national targets on biodiversity address the conservation as well as the benefit-sharing aspects of biodiversity, in addition to creating awareness and capacity building. This workshop also aims to celebrate International Biodiversity Day, taking place today. The United Nations has proclaimed May 22 The International Day for Biological Diversity in order to increase understanding and awareness of biodiversity issues. The United Nations in Maldives launched its new project, the ‘Low Emission Climate Resilient Development (LECReD) Programme’ in Fonadhoo, Laamu atoll yesterday (May 18). Azusa Kubota, United Nations Development Programme (UNDP) representative, said the ambitious programme would set Laamu atoll as a “benchmark” for future climate-smart and strategic development. Minister of Environment and Energy Thoriq Ibrahim echoed the statements of Kubota, stating that the programme would play a pivotal role in shaping the future development of Laamu atoll, paving way for more climate-resilient projects in the social and economic sectors of the atoll. The 3-year-long initiative seeks to contribute to the existing local development framework by enhancing the capacity to support low-carbon lifestyles, climate change adaptation, and disaster risk reduction in the Maldives. The US$9.2 million programme will be implemented as a collaborative effort by local organisations, the UNDP, UNICEF, UNOPS, UNFPA, UN WOMEN, the WHO and the FAO. It is the first joint implementation programme undertaken by the UN in the Maldives, and signals the adoption of a new holistic approach to address localised impacts of climate change in the Maldives, according to the LECReD press statement. The Government of Denmark, who is funding the project, have a history of supporting the Maldives in climate change awareness and mitigation programmes. In 2009 Copenhagen supported the Maldives in order that the government could attend the crucial climate change summit, just one day after the former president Nasheed announced that country lacked the funds to participate. Furthermore, in 2010 Danish ministers announced they would assist with climate mitigation in Maldives during an official visit. Speaking at a press conference held at the time, officials announced Denmark would fund climate mitigation programs in Kenya, Indonesia and the Maldives as part of its US$40 million ‘fast-track’ climate change initiative. Danish Minister for Development Cooperation Søren Pind and Minister for Climate Change and Energy Dr Lykke Friis announced they would assist with infrastructure and capacity-building projects in the Maldives. “In global climate talks there is sometimes the tendency to say ‘If we don’t agree now, we’ll just agree next year.’ But if anyone suffers from that illusion they should come to the Maldives, because here you get an education that action is needed now,” said Dr Friis. Following the latest Intergovernmental Panel on Climate Change (IPCC) report, Minister Thoriq called for a cap on global temperature rise, and pledged to increase renewable energy to 30% in the next 5 years. “Averting catastrophe is still possible,” he said in response to the panel’s argument that the world was ill-prepared for risks from a changing climate. After reports of collapsing glaciers leading to a potentially increased rate of sea-level rise were reported last week, local NGOs suggested that the Maldives was “not prepared at all” for the projected consequences. The reverberations of the the deputy prosecutor general’s resignation continued to be felt across the criminal justice system this week. Despite the Supreme Court’s order for confused state prosecutors to return to work, the majority of cases continued to be cancelled as the courts struggled to adjudicate on the leadership vacuum at the PG’s Office. This confusion was typified by Drug Court Judge Mahaz Ali, who expressed his disagreement with the government’s suggestion that a ‘state of necessity’ existed, enabling the most senior state prosecutor to assume the office’s responsibilities. While the Supreme Court announced the formation of a committee to review current judicial laws, the judicial watchdog said it would look into Judge Mahaz’s blogging. Further examination into a large crack in the Meedhoo Island reef will be required as experts admitted that the long-term effects of the 13 metre fissure were unknown. The discovery was made amid a mammoth 20 hectare reclamation project on the island conducted by Boskalis International. The Dutch company – currently conducting numerous projects in the country – came under this fire week for what local NGOs have called “environmental crimes” during its recent dredging activities. The accusations did not stop authorities mooting Boskalis as the likely partner for the government’s second reclamation phase of the Hulhumalé development project. Speaking at the launch of another Boskalis project in Thulusdhoo, President Abdulla Yameen urged the Anti-Corruption Commission to expedite stalled cases concerning infrastructure projects. Reclamation projects could take on a new urgency should this week’s prediction from climate change experts prove true, as it was revealed that the collapse of antarctic glaciers has the potential to increase sea levels by 1.2 metres in coming centuries. The completion of a Japanese sponsored solar energy project this week will be scant consolation to pessimists. Pessimism regarding the buoyancy of the country’s democracy was evident in Transparency Maldives ‘Democracy at Crossroads’ survey this week which revealed extraordinarily high levels of cynicism within the electorate. Skepticism was also evident at the Human Rights Commission’s ‘National Inquiry on Access to Education for Children with Disabilities’ as parents questioned the state’s efforts to provide education to all. The Capital Market Development Authority meanwhile was optimistic that the country can be developed into a global financial centre, while the Maldives Monetary Authority (MMA)warned that further fiscal “slippages” would undermine the country’s debt sustainability. The prospect of increased wage expenditure by the government receded once more, however, as the president returned the pay commission bill to the Majlis for the third time this week. The MMA’s warning was not enough to prevent President Yameen pledging MVR1 million to the national football team, should it reach the last four of the AFC Cup – scheduled to start in Malé and Addu next week. Visiting football fans who take a liking to the country’s southernmost atoll will soon be able to return to stay in one of the 2000 guesthouse beds that Addu City Council aims to develop via its Guesthouse Tourism Promotion Board. Finally, suggestions by the US State Department that Maldivian authorities were aware of funds being raised for terrorism abroad were rejected, as were the Maldivian Democratic Party’s suggestions that the extremist ideologies were becoming prevalent within the security services. The Maldives “is not prepared at all” for the projected acceleration of sea level rise caused by the collapse of a glacier system in Western Antarctica, local environmental groups have said. Two separate studies, by Nasa and the University of Washington, reported on Monday that unstable glaciers in the Amundsen Sea contain enough water to raise global sea levels by at least four feet, or 1.2 meters, in the coming centuries. The melting of the Thwaites glacier – caused by warmer global temperatures – has begun and cannot be stopped even with drastic action to cut greenhouse emissions, scientists have warned. The Maldives archipelago is one of the most vulnerable countries in the world to climate change, with 80 percent of its 1,200 islands lying no more than a meter above sea level. “The issue is very big, it cannot be ignored like this. The government is not doing very much,” Ecocare member Maeed Zahir said. The unexpected acceleration of the rise in sea level puts both the land mass and the people of Maldives at risk, he said. Meanwhile, environmental advocacy group Bluepeace has called on the government to make contingency plans immediately. Bluepeace founder Ali Rilwan argued “elevated adapted islands” where islands are raised by three meters through reclamation or buildings are raised on three-meter high stilts are the only solution for the Maldives. Other measures include creating water villages, he added. Former President Mohamed Nasheed had previously suggested relocating the Maldivian population to higher ground. He told the Guardian in 2008 “We can do nothing to stop climate change on our own and so we have to buy land elsewhere,” naming Sri Lanka, India and Australia, as possible spots for a refuge. “It’s an insurance policy for the worst possible outcome,” he added. The Minister of Environment and Energy Thoriq Ibrahim was not responding to calls at the time of press. The current administration’s policies on climate change have been hard to define. Researchers said that although sea level rise could not be stopped, it is still several centuries off, and potentially up to 1,000 years away. Speaking to the Guardian, The University of Washington researchers stated that the Thwaites glacier acts as a dam that holds back the rest of the ice sheet. Once Thwaites goes, researchers said, the remaining ice in the sheet could cause another 10 to 13ft (3 – 4 meters) of global sea-level rise. The report projected sea level to rise between 0.22 and 0.44 meters by the mid 2090s based on projections of thermal expansion and melting of alpine glaciers. In light of the Thwaites discovery, the rate of sea levels will double compared to the original IPCC predictions, glaciologist for the British Antarctic Survey Hamish Pritchard predicted. A clean up project took place yesterday (May 10) in the Maldvies Baa Atoll – the Maldives’ first certified UNESCO biosphere reserve. The clean up of Hanifaru Island and Hanifu reef maintenance was carried out by a large group of volunteers from within the reserve – including local councillors, police officers, and resort workers. Baa Atoll was officially launched as a Biosphere Reserve in June 2012 by former President Dr Mohamed Waheed. Obtaining the status of UNESCO biosphere resulted in significnant funding for the atoll, with the UNDP handing over a cheque for US$250,000 as a contribution to the fund at the opening ceremony. Tourist resorts in Baa Atoll, including Soneva Fushi, Coco Palm, Four Seasons, and Anantara and several other resorts have also pledged donations. The Baa Atoll Conservation Fund will be used to finance projects to conserve the environment in the atoll as well to support livelihood activities. The United Nations Educational Scientific and Cultural Organisation (UNESCO) coordinates a world network of over 500 biospheres, which are designated as areas of conservation and innovative sustainable development. In a recent statement from the Biosphere Reserve Office, the organisers extended their gratitude to everyone who helped with the clean up, assuring that together they can achieve the common goal of managing the reserve. Participants in the cleanup of Hanifaru included those from the atoll council, Eydhafushi Island Council, Baa Atoll Education Centre, the Maldives Police Services, and Baa Atoll Hospital. The Hanifaru reef cleanup and maintenance was undertaken by Four Seasons, Seamarc, Reathbeach Resort, Dusit Thani, Seasplash, and Kihaad Maldives.